SORRY, sis! I didn’t mean to give you such a big fright! Last week I threw a joint bash for both of us to celebrate the MBE I collected last week – and, more importantly, my sister’s birthday. Early on I took to the stage at St Andrew’s in the Square in Glasgow to read out a message to Elaine from a pal of mine. It was from Jason Donovan – one of Elaine’s heroes – wishing her a happy birthday. My big sister’s face was a picture as Jason appeared from nowhere to sing a few of his hits on stage with the live band. She was as surprised at Jason as I was at myself for keeping it all a secret. Have you ever tried to smuggle an Australian pop star into Glasgow? It’s not as easy as it looks! As well as my family it was great to see pals including Sir Tom Hunter, Allan Stewart, Jennifer Reoch, Paul Young and many others. There were some great guests there – including Paul Cooney from Radio Clyde in Glasgow. He was one of the guys who gave me my first break on the radio – I can’t thank him enough. Also joining me were some of my colleagues from The Sunday Post, who obviously, heard there was a free bar. The special VIP guest on Wednesday night was undoubtedly Auchenshoogle’s most famous resident, Oor Wullie. 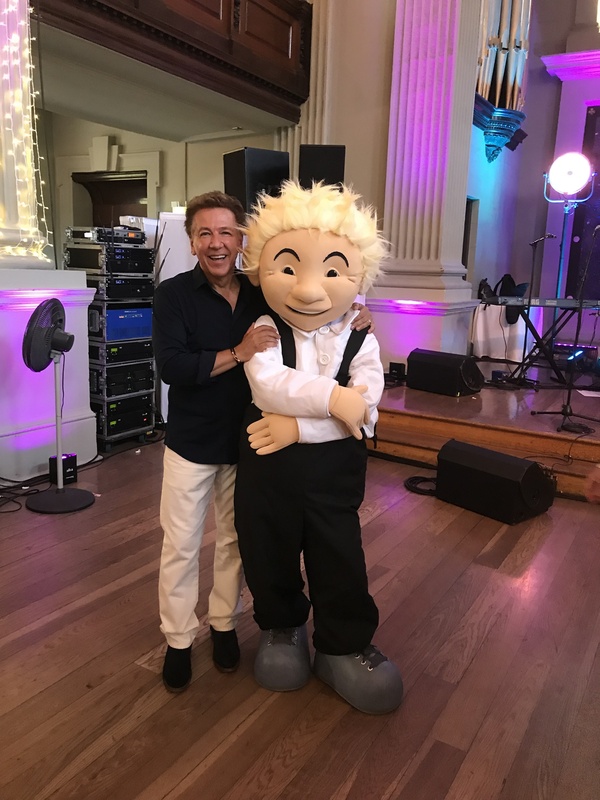 Thanks for coming along, Wullie – it was so hot on Wednesday night we were aw sweating buckets! I was glad Elaine had a great time, as did my niece and nephew Holly and Euan. One thing I learned is I now sympathise with stars who bubble up when they get an award. I barely managed to thank my mum and dad, who I wish were still here to see me pick up the MBE. I’ve been doing this for a long time now so to be recognised is a huge honour, and such a thrill. And if anything then I’m due another award – Piers Morgan took time to congratulate me on Good Morning Britain last week. Look, it got him talking about something other than England winning the World Cup for at least five minutes!